March 15, 2016 By This post may contain affiliate links. 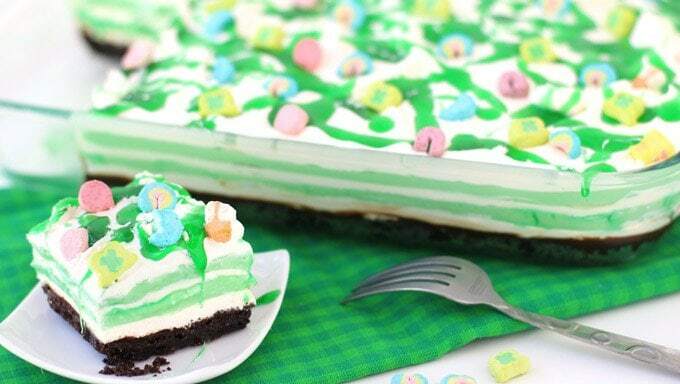 This St. Patrick’s day serve these bright green Shamrock Shake Cheesecake Bars. This festive dessert has has layers of crème de menthe pudding, cream cheese fluff, and whipped cream are drizzled with crème de menthe and chocolate syrup, all topped with Lucky Charms marshmallows. If you are searching for a tasty treat to make for a St. Patrick’s day pot luck, this is sure to be a hit. The combo of chocolate and Creme de Menthe pairs so nicely with the cheesecake layers. Speaking of layers, my dessert quite a few of them. I was asked to make it look like a lasagna style dessert. It turned out nice, but the layers are thin. I think it would look just as nice with one big layer of mint pudding and another layer of cheesecake. The dessert is topped with a thick Creme de Menthe glaze which adds another pop of mint flavor. Toss on some Lucky Charms marshmallows if you want to make this fun for St. Patrick’s Day. 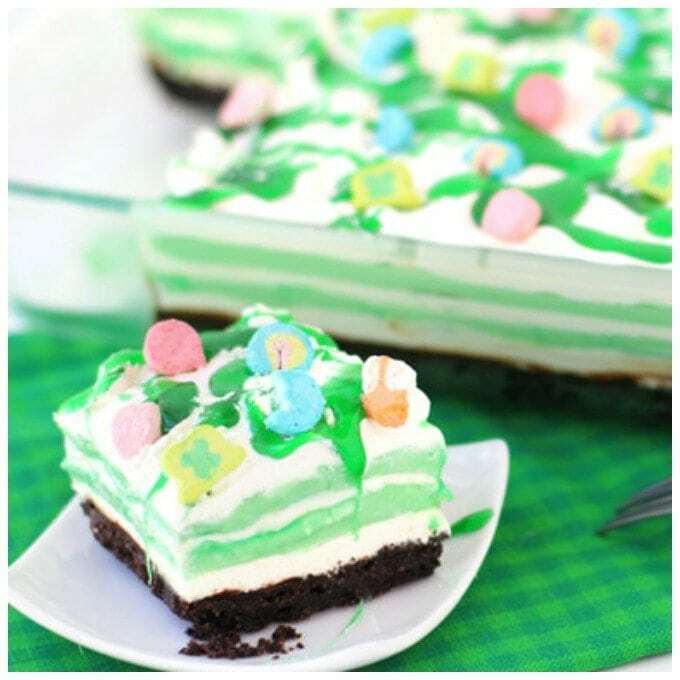 You can find the recipe and step-by-step tutorial to make these Shamrock Shake Cheesecake Bars on Tablespoon.com.